Frost Atronachs are Elemental Daedra native to Oblivion. They apparently have an enmity for Flame Atronachs, though they are able to put this aside when serving mutual masters. 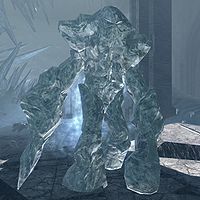 Seemingly made entirely of ice, they can be found unbound in the wild or can be conjured by those with magical aptitude to serve as guards, laborers, or otherwise obey their conjurers. Summoning of Flame Atronachs is usually performed through Koron's Peremptory Summons, a spell which usually summons Frost Atronachs in their conventional forms but which can be altered by conjurers to alter the minutiae of the summons (such as plane to summon from, daedra to summon, and form in which the daedra can be conjured). They are a source of Frost Salts, an alchemical ingredient which has varied utility. They are conventionally summoned and found in the form of bulky humanoids. Frost Atronachs as a collective were apparently employed by Xivilai Moath during the Third Era, and were heavily involved in the Battlespire invasion. Frost Atronachs are found in many Daedric Realms, including those of prominent princes and minor planes. While possessing some intelligence, Frost Atronachs are largely an unorganized and chaotic group, with individuals being largely indistinguishable from one another. Many frost atronach names begin with the word "Nomeg". Aside from the commonly found humanoid forms, there are many other types of frost atronach found in Nirn and Oblivion. Ancient Frost Atronachs are a rare form of Frost Atronach. They possess broader torsos and are significantly stronger than their standard counterparts. The only known instance of an Ancient Frost Atronach being summoned was by the Snow Elf vampire Arch-Curate Vyrthur during their confrontation with Serana and the Last Dragonborn in 4E 201. 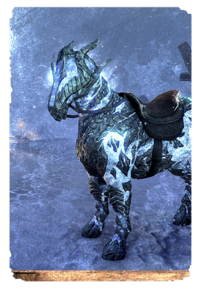 Night Frost Atronach Steeds are a form of Frost Atronach conjured in the shape of horses, possessing most of the conventional features and structures of horses but also being constructed of ice.Their summons were known to be in circulation around the time of the Planemeld. 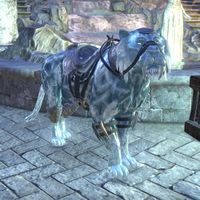 Sabre Cat Frost Atronachs are a form of Frost Atronach conjured in the shape of sabre cats, possessing most of the conventional features and structures of the large felines but also being constructed of ice. A Frost Mage of Clan Direnni spent her entire life perfecting a spell to permanently summon an atronach of this type. The little-known Frost Mare horse (theorized to come from the Fourth Sinus of Takubar) is composed entirely of ice, though its relation to frost atronachs is unknown.